Anyone with an interest in nature and wildlife should consider a journey to Finland. Finland has a diverse and extensive range of fauna. Some of the wildest places to enjoy wildlife are Kuusamo, Ruka, Rovaniemi, Taivalkoski and Oulu. Photo. 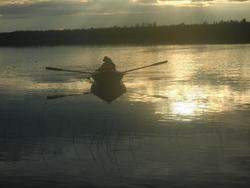 Experiencing sunset in a boat in Taivalkoski in northern Finland. © Travel Explorations. There are at least sixty native mammalian species, 248 breeding bird species, over seventy fish species and eleven reptile and frog species present today. Many of them migrated from neighboring countries for thousands of years ago. Large and widely recognized wildlife mammals found in Finland are the national animal the brown bear, gray wolf, wolverine and elk (moose). The Republic of Finland is one of the Nordic countries. The country is also inhabited of people with unique charm and guts that themself are a genuine tourist attraction. Close to the Arctic circle and Russian border, is a natures lover's paradise in the summer. Canoeing in the river Oulankajoki, Oulanka River, in Ruka, Kuusamo, in Finland is an unbelievably relaxing experience, and at the same time very entertaining. Read more of our articles and watch photos on our global travelguide Travel Explorations. Read more and watch amazing photos on: Finland Adventure Travel on Facebook. Rovaniemi, Lapland, Finland - Northern Lights. It's a great season (March 2012) to see Northern Lights (Aurora Borealis). Sun is very active right now and that's why we can enjoy this unbelievable nature phenomena almost every night. Of course sky need to be clear and cloudless. Sauna rituales in the deep forest in Finland! There is a time you really feel free. It`s when you enjoy sauna deep in a dense forest in Finland. Here are some rituals for achieving the best out of the sauna. It`s best to do it the Finnish way! Northern lights, Aurora Borealis, Rovaniemi, Muonio, Lapland, Finland - Watch the video and discover the amazing lights! Kastelli at Pattijoki, Finland - Exploration of the huge stone circle! Into the deep pine forest in almost nowhere, I and my guide finally reached the circled shaped Stone Age ruin of Kastelli at Pattijoki in Finland!